This recipe is mostly protein and a little carbohydrates. Serve with some fat and an additional side of carbs to keep it balanced and stabilize your blood sugar. Dysphagia Level 2 – Ground/Mech Soft – omit tomato jam. Chop cod and top with plain tomato sauce and cheese instead. Dysphagia Level 3 – Soft – omit tomato jam. Cook cod according to recipe and top with plain tomato sauce and cheese instead. Preheat oven to 350ºF. Lightly spray two baking sheets with cooking spray. Cut 1 cup of cherry tomatoes in half lengthwise and place on a baking sheet. Bake for 10 minutes. Meanwhile, season fish with black pepper and place on a separate baking sheet. When tomatoes have been baking for 10 minutes, place fish in oven and bake for 12-15 minutes alongside tomatoes. While fish and tomatoes are baking, prepare the tomato balsamic jam. Place remainder 1/2 cup cherry tomatoes into small food chopper or food processor and finely chop. Add balsamic vinegar and red wine to a small saucepan over medium heat. Add chopped tomatoes, thyme, garlic, and red chili flakes (optional) and allow to simmer until liquid is reduced by half. 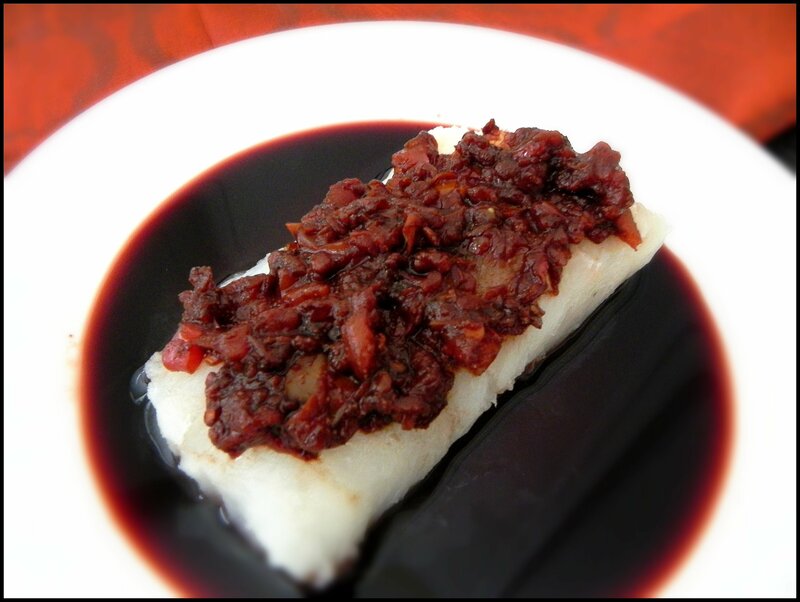 Remove roasted tomatoes and fish from oven and top with jam. Garnish with additional dried thyme and red chili flakes if desired.